at 218 West Saratoga Street located in the Bromo Tower Arts and Entertainment District in downtown Baltimore. One of the most celebrated annual events among the Baltimore arts community, Out of Order provides an opportunity for emerging artists and professionals to hang their work in a salon- style exhibition while making meaningful connections with patrons at the event. For OOO’s 20th Anniversary, MAP is celebrating art of all ages with an accompanying youth-driven exhibition: KIDOOO. The exhibition and silent auction will open in tandem with Out of Order in the new MAP Members Gallery, located on the second floor of Maryland Art Place. KIDOOO was created as an opportunity for young artists to exhibit their work in a major arts venue, expanding MAP’s services to students in elementary, middle and high school level arts classes. We encourage all young artists to apply! Eligibility: All artists working in all mediums. KIDOOO applicants must be ages 6-16 years old. Requirements: Each piece must be framed and ready to hang with dimensions under 40”x 40”. All artwork must be for sale. Proceeds from the silent auction are split mutually between MAP and the artist. KIDOOO artwork must meet dimensions of 24” x 24 or under. Above requirements for KIDOOO apply. Application Fee: Application fee is $10 for Out of Order. There will be no fee for KIDOOO applicants. 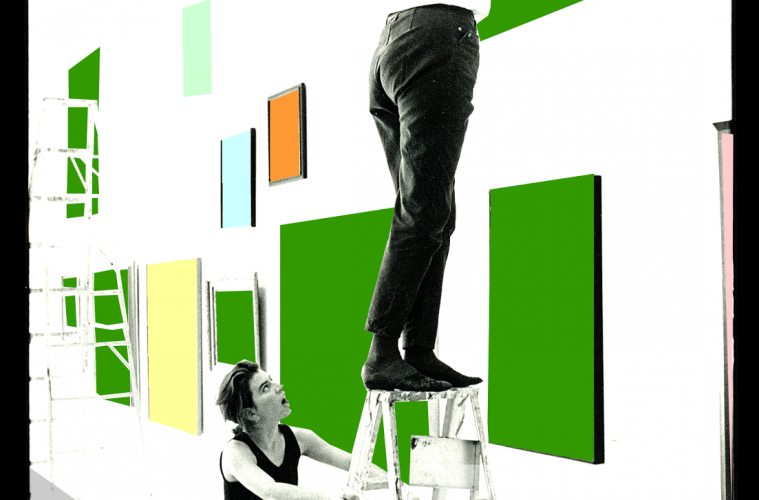 OOO Installation Day: Thursday, March 30 from 7 am – midnight. OOO is a self-install exhibition. Exhibition and Silent Auction: Artists are invited to attend the event for free. Guest tickets can be purchased on MissionTix by visiting www.mt.cm/out-order. 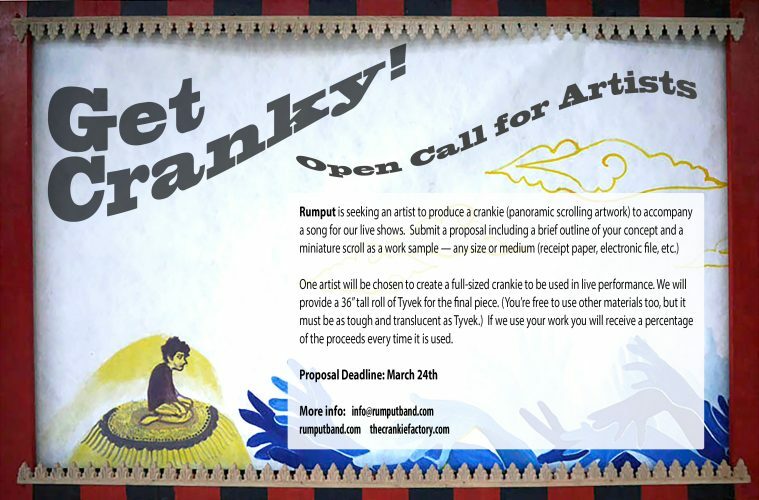 Call for Artists: Get Cranky! 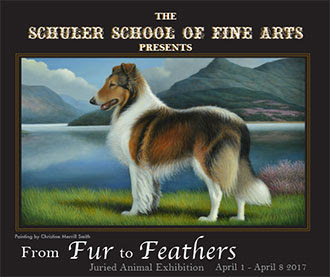 The Schuler School of Fine Arts is hosting the 8th Annual Fur to Feathers Juried Animal Exhibition from April 1-8, 2017 at its historic studio in Station North. This year esteemed painter Christine Merrill will judge entries. 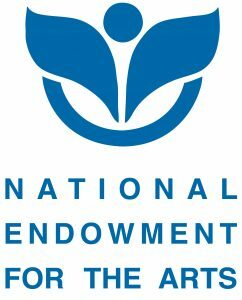 The White House released its proposed budget to Congress today, officially recommending full termination of funding of both the National Endowment for the Arts (NEA) and National Endowment for the Humanities (NEH) for FY2018. This is the first American President in history to propose zeroing out all funding for the nation’s federal cultural agencies. Eliminating the NEA would be a devastating blow to the arts in America. For more than 50 years, the NEA has expanded access to the arts for all Americans, awarding grants in every Congressional district throughout all 50 states and U.S. Territories as well as placing arts therapists in 12 military hospitals to help returning soldiers heal from traumatic brain injuries. The NEA is also an economic powerhouse, generating more than $600 million annually in additional matching funds and helping to shape a $730 billion arts and culture industry that represents 4.2% of the nation’s GDP and supports 4.8 million jobs. The most important thing you can do is to take two minutes to send a customizable message to your elected representatives in Congressand urge them to oppose any attempt to eliminate or cut funding to the NEA. Post on Facebookand Twitter to help rally national support to save the NEA. There is strength in numbers and your social media friends can help. We’ll be at Arts Advocacy Day next week, helping to ensure there is a strong voice in support of the arts. In the meantime, make sure to watch our social media accounts to stay up to date on the latest news. Find us on Facebook. Find us on Twitter. Join the BMA on Saturday, April 1st for an important teacher workshop on art and the LGBTQI+ experience. Explore the Queer Interiors exhibition with artists Rahne Alexander and Jaimes Mayhew; hear from young people in the LGBTQI+ community about their experiences; learn fundamentals about LGBTQI+ identities and how to be a good ally to your students and colleagues with Kate Bishop of Chase Brexton Health Care; and make a button that visually communicates a vital part of your own identity. This workshop is $20 for Members and $25 for Non-Members. Please visit https://artbma.org/educators/workshop.html to register. 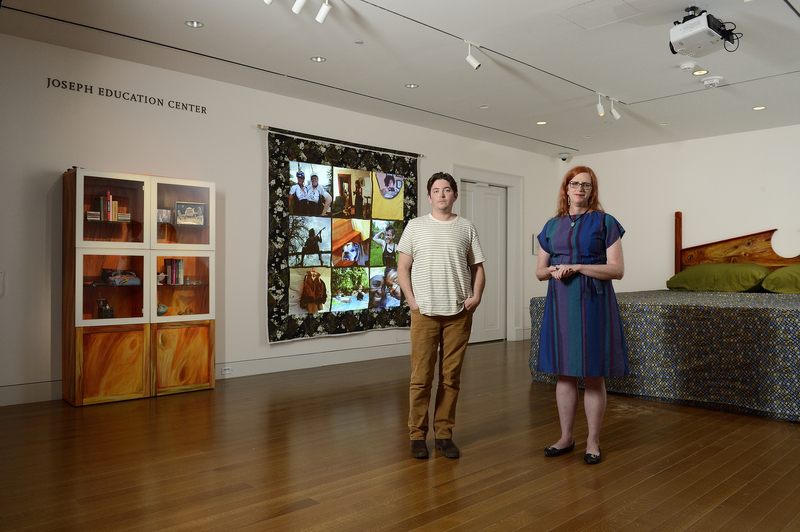 15th Annual Trawick Prize: Bethesda Contemporary Art Awards. The annual juried competition, founded by Carol Trawick and produced by the Bethesda Arts & Entertainment District, awards $14,000 in prize monies to selected artists and features the work of the finalists in a group exhibition. The jury will select up to 10 finalists who will be invited to display their work in a group exhibition in downtown Bethesda in September 2017. Applicants must be 18 years of age or older and permanent, full-time residents of Maryland, Virginia or Washington, D.C. All original 2-D and 3-D fine art including painting, drawing, photography, sculpture, fiber art, digital, mixed media and video will be accepted. 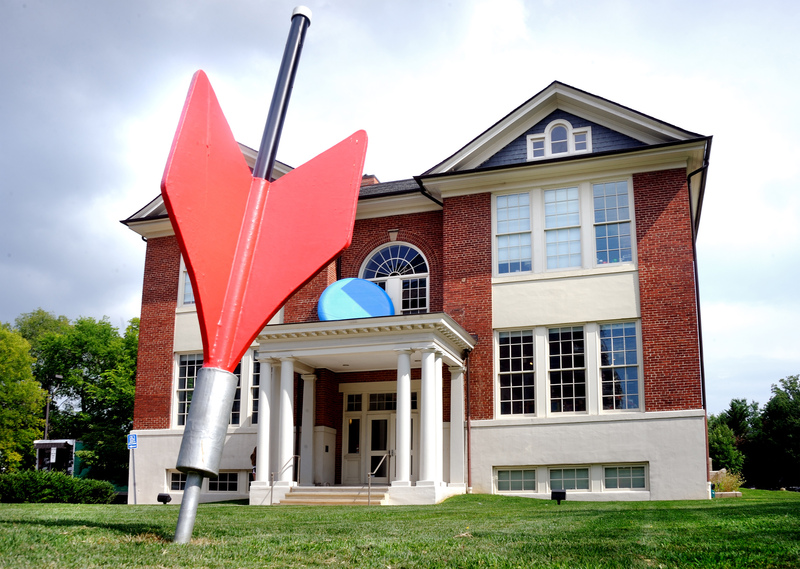 Street view of Cory Oberndorfer’s sculptures, “Lawn Dart” and “Frisbee” on the grounds of Arlington Arts Center. Exhibition proposals are reviewed by jurors who then make recommendations on exhibitions for inclusion in SOLOS. The 2017-18 jurors are: Kate Haw, Director fo the Smithsonian Institution’s Archives of American Art and Mika Yoshitake, Assistant Curator at the Hirshhorn Museum and Sculpture Garden. Each year, artists from across the Mid-Atlantic are selected for solo exhibitions to take place in one of AAC’s seven separate gallery spaces, or outside on the grounds resulting in an exceptional suite of cutting-edge exhibitions featuring art in variety of media. Proposals that specifically take into account AAC’s space, layout, and surrounding environs are encouraged.